Airbags are supposed to reduce injuries in case of an automobile crash, especially if a collision occurs at high speeds. They are connected to a sensor that signals deployment when the car is in a crash. The airbag absorbs some of the force of the impact and serves to buffer a driver or front seat passenger from colliding with the dashboard. When they are appropriately designed, an air bag can reduce or prevent certain injuries. However, some air bags have defects. They may deploy at the wrong time, explode, or fail to deploy or deflate. They can cause a broken neck, disfigurement, brain hemorrhage, severed brain stem, spinal injury, paralysis, or bone fractures. If you have been hurt by a defective airbag, the airbag defect lawyers at Moll Law Group are available to seek compensation for your injuries. Billions of dollars have been recovered in cases in which our auto defect attorneys have been involved. Airbags deploy within a fraction of a second when someone is driving at high speeds. In many cases, a malfunction is caused by a defective crash sensor that does not send the right signals, sends them at the wrong time, or deploys only one of the two airbags. The manufacturer and other parties responsible for maintaining, inspecting, or replacing an airbag may be liable for a defect. After an accident, it is important to preserve the airbag and take pictures of it for use by an expert. The expert will be able to determine whether there is a defect in the sensor or airbag. Defects can be the result of manufacturing flaws, design flaws, or marketing flaws. In most cases, an airbag system that is defective has a design defect. A design defect is a flaw within the design that makes the airbag inherently dangerous, even when it is made of good quality materials and manufactured according to specifications. A plaintiff trying to establish a design defect with the assistance of an airbag defect lawyer may be required to use the risk utility test or the consumer expectation test. In the former, the manufacturer is responsible if the probability and severity of injury to a consumer is more than what it would have cost to use an alternative safer design and the diminished utility of that alternative design. A manufacturer is responsible if the airbag did not perform as safely as an ordinary consumer would expect it to perform if it is used in a reasonably foreseeable way. A claim against a manufacturer for a defective airbag can be based on theories of strict liability, negligence, or breach of warranty. In most cases, it is necessary to retain an experienced, knowledgeable expert. If you are pursuing damages based on strict liability, you need to establish that there was a manufacturing, design, or marketing defect and that the defect caused your injuries. 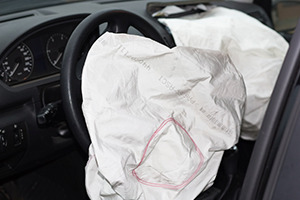 Unlike plaintiffs in many other types of personal injury cases, a plaintiff suing for harm caused by a defective airbag under a strict liability theory does not have to prove that the manufacturer was negligent in the design or manufacture of the airbag. At Moll Law Group, our product liability lawyers are available to represent you in a claim to recover compensation from a car manufacturer and other potentially responsible parties on your behalf. We represent injured consumers nationwide, including in Illinois, Florida, Texas, California, New York, Ohio, Michigan, Massachusetts, Missouri, and Pennsylvania. Call us at 312-462-1700 or use our online form to set up a free consultation with an airbag defect attorney.